Bianca and Sascha, bloggers and foodie couple behind Elephantastic Vegan and The Veginner's Cookbook believe that any reason to adopt a vegan lifestyle is a great reason, and your decision to stop eating animal products will be one of the best of your life. Vegans still love breakfast sandwiches. And popcorn chicken. And mac and cheese. And all the other comforting, delicious foods we grew up with. Don't worry, having these cravings is completely normal and part of every vegan's life. 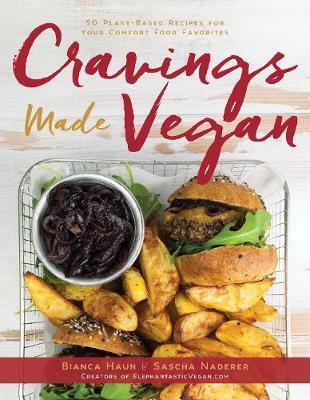 Cravings Made Vegan offers plant-based resources and guides for every meat eater, cheese lover, and milk drinker followed by a unique collection of fifty detailed recipes to create surprisingly delicious alternatives for all those non-vegan dishes you still hold dear. Recipes include melted cheese sandwiches, hearty sausages, baked almond feta, and a steaming hot chocolate fudge pudding that will make you forget about your pre-vegan life. Bianca and Sascha offer easy vegan swapping alternatives for all your favorite meat and dairy products and answers to every vegan's most-asked questions: how to make food taste and look like it has eggs in it, how to make tofu not boring, and how to satisfy that bacon craving. Bianca Haun is the food blogger behind Elephantastic Vegan, where she shares her favorite plant-based recipes and spreads the word about veganism without being too preachy about it. Together with her boyfriend, Sascha, they are a foodie couple that, after adopting a plant-based diet, fell in love with food all over again. Sascha Naderer is the stew-cooking, breadstick-eating, avocado-craving side of this book. To him, cooking is about creativity, spontaneity, and tons of garlic, and he sees decadent vegan food as the perfect way to enjoy great food without having to compromise his ethics. He and Bianca currently reside in Linz, Austria.